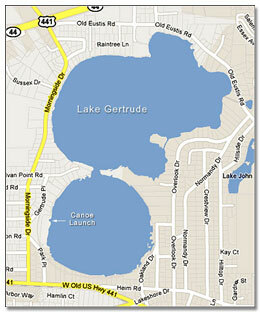 Lake Gertrude has some of best water quality of any natural lake in the State of Florida. The "Doctor's Lake" is spring-fed with a white sand bottom. Most of the lake is within the City limits of Mount Dora and historic Mount Dora is just a short walk away. The water is crystal clear, fish are abundant and clearly visible from any boat dock. Public Access to Lake Gertrude is limited except for a small canoe launch area on the west side. Swimming, fishing and water skiing are popular with lakefront property owners. The lake is lined with beautiful lakefront homes of all description. Historic cottages and huge 10,000 sq. ft. estate homes site side-by-side. Homes for sale are never plentiful and when one comes on the market it draws a lot of attention. The streets around Lake Gertrude are park-like with locals drawn to the peaceful setting for a morning or evening walk. Alligators and snakes are rare in Lake Gertrude. Much work has been done to keep Lake Gertrude pristine. A extensive new system of retention ponds was recently constructed to keep storm water from running into lake. Home prices on Lake Gertrude are pricey, even by Mount Dora standards. Small homes start around $500,000 and some have sold for well over $1 million. Lake Gertrude is deep for a Florida lake and spring-fed which keeps lake water levels from fluctuating significantly. Mount Dora has some of the highest elevations in the State. A high ridge runs across the top of Lake Gertrude with the beautiful and historic "Lake Eustis Road" below. Homes build on this hill have a spectacular view of the lake from their front porch. Lake Eustis Road is a narrow two lane road running through a canopy of huge grandfather oaks draped in Spanish moss, a "must-see" visitors of all ages. If you have questions about Lake Gertrude, please contact us.